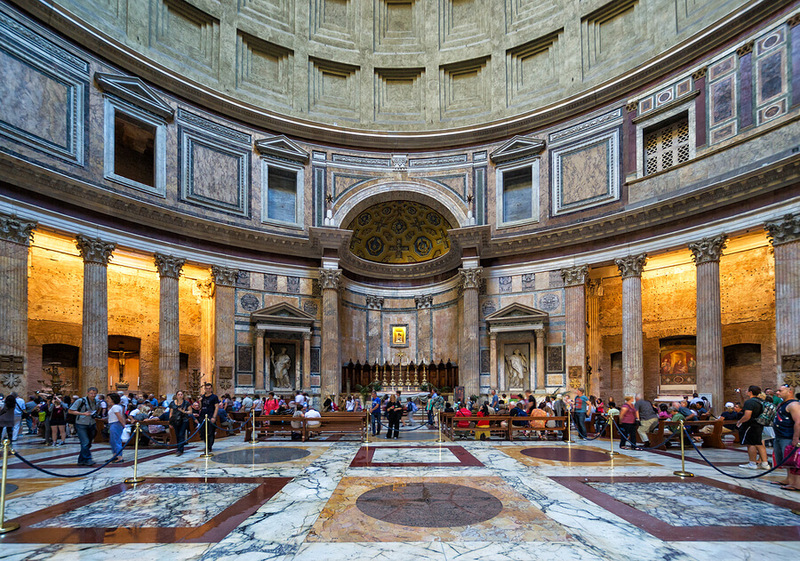 The Pantheon in Rome is an awe-inspiring structure and a must see sight on any Italian vacation or visit to Rome. It is a window into the past since it is perhaps one of the best-preserved structures from Roman times. Added to this it is a fantastic piece of engineering and architecture – the likes of which we have not seen again. The Pantheon of Rome was originally a Roman temple dedicated to all the gods of Pagan Rome. The dates on the structure reveal that it was built at some point between AD 118 and AD 125. Although classified as a temple, it’s not clear how it was used since its layout differs from many other Roman temples, particularly from those you will see in the Roman Forum. The Pantheon Church is unique because it survived. The Pantheon Rome is unique because it survived. It survived and is so well preserved because it never fell out of use. Originally built as a temple, it was given to Pope Boniface IV in AD 608 by Byzantine Emperor Phocas. And it has been used as a church ever since. The architecture of the Pantheon Church Rome is fascinating. The structure of the Pantheon seems to be ahead of its time. It is well preserved partly because it stayed in use but also because of the materials and precision used in its creation. The Pantheon’s dome was the largest in the world for around 1300 years and it is still the largest unsupported dome in the world today. The structure of this is a lesson in real precision engineering since the diameter of the dome is the same length as the distance from the floor to the top of the dome itself. Also, the density and the dimensions of each block used to build the dome would have had to be absolutely correct – or risk throwing the structure off course. The details of the Pantheon’s interior are just as captivating. The Oculus – or the hole in the top of the dome is the only source of light and is thought that the Roman’s saw this as the connection between the temple and the gods above. The marble floor of the Pantheon Church in Rome is the original from Roman times. And the 16 Corinthians columns that support the portico were brought all the way from Egypt. They were pulled from the quarry where they originated to the Nile on wooden sledges – perhaps using slave labour. Then they travelled by barge down the Nile to the Mediterranean Sea and then finally travelled up the Tiber to Rome. It is a huge distance for such structures to have travelled. The Pantheon is also now a resting place. The Renaissance painter Raphael and his fiancée are buried within the Pantheon, as are the Italian Kings Vittorio Emanuele II and Umberto I. The Pantheon was also an inspiration. It is said that when Brunelleschi was considering how to build the Dome on Florence’s cathedral – or the Duomo as it is sometimes called – he came to the Pantheon to examine the structure of its Dome. Private Best of Rome by car. Please feel free to get in touch at tours-italy.com for more information and guidance. And if you would like to see what our guests who experienced our Italian tours with us earlier this year had to say, then please feel free to take a look at our Facebook page and you can also find us on Trip Advisor too. Also, if you are looking for some travel inspiration similar to this guide on why you should visit Rome or any other Italian cities and sights, please do check out our other blog posts. We have many useful guides on Italian holidays.